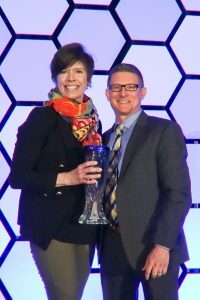 The next award will be presented at the 19th Annual Educational Conference and Trade Show March 12-13, 2019 at the Colorado Convention Center. This award is given each year to a person within the industry that has demonstrated active leadership within one or more industry associations and has displayed the personal and professional integrity that allows them to stand out among their peers. Thank you in advance for making the effort to recognize an outstanding meeting professional. All submissions must be turned in no later than 5:00 p.m. on Friday, February 8, 2019. Please pass along this opportunity to your active membership. Anyone with membership in one or more of the 13 MIC Associations may nominate individuals or themselves for the award. The MIC Nomination Committee will review all submissions in and select the winner for the March Conference. Anyone with membership in one or more of the 13 MIC associations may nominate individuals or themselves for the award. Role Model to other Meeting Professionals. We also ask that you send us a picture of the nominee if available.